The world first test of the 2009 Triumph Daytona 675 is taking place in Spain - and this is today's update - how the Daytona 675 performs on challenging mountain roads. Triumph's new Daytona 675 motorcycle performs faultlessly on the road. The fully updated new Daytona 675 has proved more than a match for the twists and turns of the local Spanish roads. The Triumph Daytona's superb midrange from the triple cylinder engine is right on the money. It literally is a matter of opening the throttle at any revs for the bike to pull and, like the track report stated yesterday, the bike's chassis performs superbly. There are several things that instil confidence in the rider: one is the superb suspension and another is the Pirelli Diablo Super Corsa SP tyres. Then there are the excellent Nissin brakes which bail you out at the slightest sign of getting it wrong. Although the seating position is still high at the back and the clip-ons low there is still plenty of room to move about on the seat and enjoy the twisting roads. Some of the bikes on the test have been fitted with Triumph's aftermarket Arrow exhaust cans and to hear the exhaust droning through the valleys makes the hairs on the back of your neck stand like Velcro. High-speed jaunts on the fast flowing A-roads showed the Daytona to be very, very stable. All-in-all Triumph have got this bike spot-on. Almost three years to the day Triumph have released the latest version of the Triumph Daytona 675. 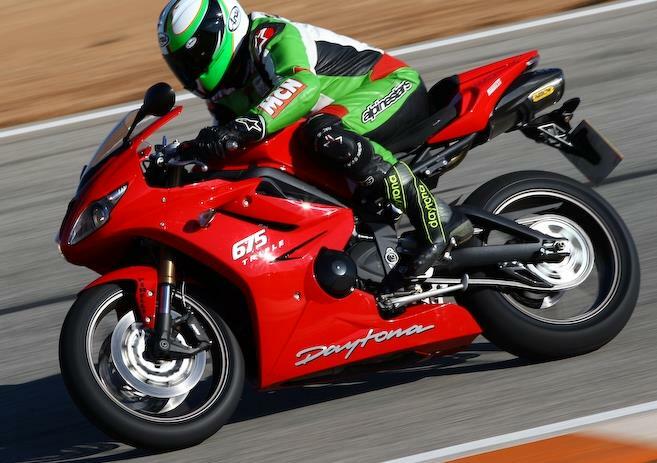 The first day of the Triumph Daytona 675 test session for the press took place at Cartegena Circuit, Spain. The tight twisting circuit has proves how agile the new model is – and how strong the three cylinder is through the mid-range. The improvements of a lighter chassis and three brake horse power more at peak power really make a difference down the main straight; hook another gear through the sweet gearbox and the bike just drives and drives, all the time with that triple cylinder howl coming out the under-seat exhaust. Intoxicating is not the word. In the mainly second and third gear turns the throttle can be nailed from as low as 3,000 rpm and the bike responds beautifully, with the flat torque curve the triple is renowned for. It doesn’t matter if you miss a downshift, the engine will always pull you out of trouble. As for handling, Triumph have worked wonders with the Daytona’s Kayaba suspension, which now features high and low speed compression damping front and rear. While some riders are reporting exemplary suspension movement yours truly needed just a touch more front pre-load to reduce the amount of front fork dive from the violent weight transfer of 15.5 stone (naked). The new Nissin monobloc calipers and discs are full of feel at the lever while maintaining strong braking pressure from the high speed start finish straight, there is a back brake. Cosmetic changes only include the cockpit lay out with a revised upper fairing and headlight. This gives the bike a fresh, modern style combining modern supersport and a touch of Ducati with the visible rear sub frame tubes. What would a Daytona 675 cost to insure against other similar models?